West Virginia offers up a bounty of such intimacy. There’s the sweet beauty of the Appalachian Mountains, a quiet resilience to its people, and a chance to visit the past while watching its residents move surely to the future. Winter Park is known for outstanding outdoor adventures–skiing, snow cats, snowmobiling, and more–but the food is the unsung hero. I stepped off the train into a blizzard. As I stood there trying to figure out where to go, I heard the conductor’s cry of All Aboard!, and knew I would soon be left to fend for myself. Yet fear never entered my consciousness. Instead, fully immersed in the moment and its requirements, I took the next step. Why Would I Go To New Orleans Alone? A light rain started as I climbed through the window to the balcony of my room at the Hotel Maison de Ville in New Orleans. I felt like a teenager sneaking out after dark for a secret tryst. The air was thick with humidity and the rain broke some of the day’s heat, if only briefly. There was an overhang on the balcony, so I sat outside, feet propped on a table, drinking a café au lait and watching the revelers just one block over on Bourbon Street. SUMMER MAY BE OVER, but head to the American South and you’ll find great places to camp deep into the fall months. From Florida to South Carolina, campgrounds have fewer crowds and plenty of space to set up a camp chair, light a campfire, and enjoy the fall season at a different pace than in the summer months…. 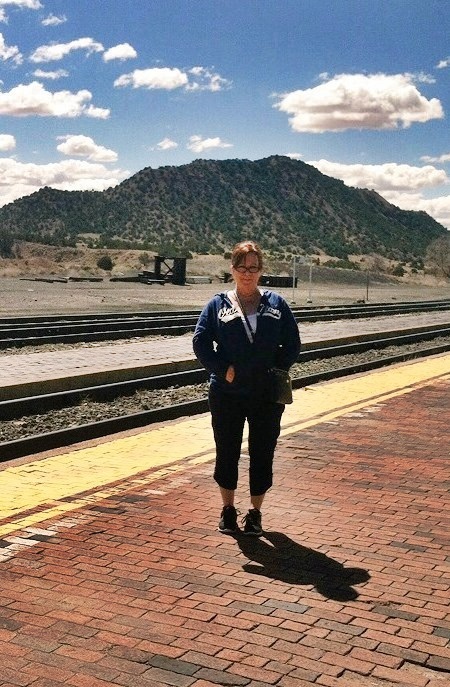 Jill, waiting for a train in Lamy, New Mexico. Travel writer and publisher of Evolving Magazine, Jill Dutton caught the train travel bug when she spent three months in Europe with a Eurail pass. Now, she enjoys traveling–and writing about–the U.S. and Canada by train (and plane). While traveling, she seeks out what foods are indigenous to an area, the local food scene, outdoor activities, wine & spirits, and wellness modalities. Readers of her blog (USAbyRail.blog) have come to expect an intimate look at authentic experiences. As a Kansas City expert, Jill’s travel guide, Best of Kansas City, launched number one in its category on Amazon. She has lived in Kansas City her entire life. As the Kansas City expert, Jill is preparing to write 11 city profiles on a Coffee Tour for the area CVBs. Her personal interests include gardening, kayaking, writing, and cooking. A kayak and paddleboard enthusiast, Jill keeps her Advanced Elements AdvancedFrame Kayak in the trunk of her car for, you know, just in case. This summer she has hiked and explored waterfalls in Tennessee, kayaked on the Missouri river with the Kansas City skyline as the backdrop, seen the wildflowers in bloom in Texas, taken a ferry across Lake Michigan to hike Washington Island, WI, and played on the beach in North Carolina.